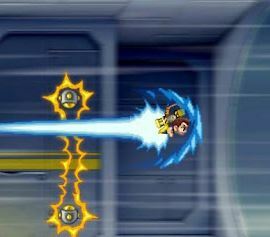 I loved Jetpack Joyride when it launched on iOS. I remember playing through the entire game in about two days before I sold my iPhone 4 and moved to Android. But it’s an incredible game and, now, it’s available for all Android users. The idea is super simple: Barry (the guy wearing the jetpack), needs to escape a lab filled with scientists. You’re in control and the goal is to grab as many coins as possible, or finish mini-quests like high-fiving scientists. You’ll need to do this while avoiding obstacles, including missiles, electro zappers and lasers, along the way. 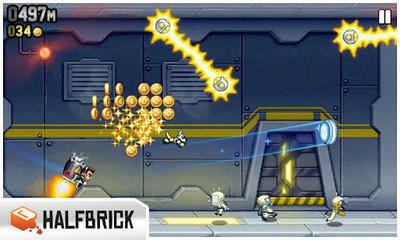 Jetpack Joyride is available for free from Google Play now. Download the award-winning mobile game for free on Google Play September 28th, Brisbane, Australia – Today marks the long-anticipated Android launch of one of the biggest names in mobile gaming – Jetpack Joyride! With over 35 million downloads around the world so far, millions more can now suit up as Barry Steakfries and join in the high-flying phenomenon. Down on his luck as a struggling gramophone salesman, Barry comes across the “secret” laboratory of Legitimate Research, a corporation dedicated to developing crazy new technologies. Seizing the chance to become a hero, Barry begins his ride after commandeering a jetpack and making good his escape, where the player jumps in and guides his adventure with accessible one-touch gameplay. Along the way, players must avoid lasers, missiles and electro zappers, all the while grabbing coins and trying out even more ridiculous vehicles – Lil’ Stomper, Profit Bird and the robot dragon himself, Mr. Cuddles!